“GUAM” redirects here. For the Pacific island territory, see Guam. GUAM’s charter was signed during a summit in Yalta on 6 to 7 June 2001 by the four current members and Uzbekistan, which later withdrew. According to the former Ukrainian President Viktor Yushchenko the charter set objectives for cooperation, such as promoting democratic values, ensuring stable development, enhancing international and regional security and stepping up European integration. Moldova’s 2000 elections were won by the Party of Communists of the Republic of Moldova who subsequently realigned their foreign policy towards Europe shortly before the parliamentary election held in March 2005. Given the existence of the Russian-led Commonwealth of Independent States (CIS), GUAM is sometimes seen in Russia as a way of countering the Russian influence in the area and as part of a strategy backed by the United States. However, GUAM leaders repeatedly and officially dismiss such claims and declare their strong willingness to develop close friendly relations with Russia. Moreover, Azerbaijan, the group’s main energy power, has managed to avoid any conflicts with Russia in recent years. In 2014, the group moved to use English instead of Russian as a working language at its meetings. ruling committee on cooperation in trade and transportation. 70-kopeck Ukrainian postage stamp commemorating the GUAM Summit held in Kyiv, 22–23 May 2006. 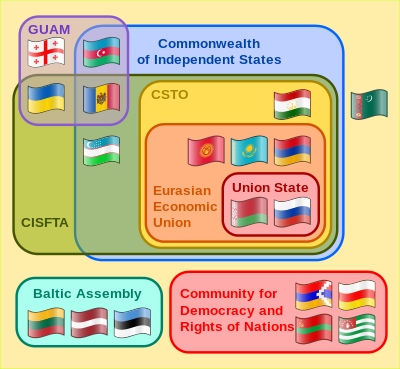 Cooperation between Georgia, Ukraine, Azerbaijan, and Moldova started with the GUAM consultative forum, established on 10 October 1997, in Strasbourg and named after the initial letters of each of those countries. In 1999, the organisation adopted the name GUUAM due to the membership of Uzbekistan. A summit in Yalta on 6 to 7 June 2001, was accompanied by the signing of GUUAM’s charter which formalized the organization. However, in 2002, Uzbekistan announced that it planned to withdraw from the organization, and following this announcement started to ignore GUUAM summits and meetings. On 24 May 2005, shortly after the Andijan massacre, Uzbekistan finally gave an official notice of withdrawal from the organization to the Moldovan presidency, thus changing the group’s name back to GUAM. In the years following the signing of its charter the grouping was generally considered[by whom?] to have stagnated: for example, only two of the five leaders attended the 2004 meeting in Yalta, while the GUUAM official website still showed the old Georgian flag and listed Uzbekistan as a member. A summit of GUUAM took place in Chişinău, Moldova, on 22 April 2005. The president of Uzbekistan, Islam Karimov failed to attend, as did the president of Poland, Aleksander Kwaśniewski, who had been invited as an observer. The presidents of Romania, Traian Băsescu, and of Lithuania, Valdas Adamkus, both participated as observers, as did the US Department of State special representative for Eurasian conflicts, Steven Mann, and the OSCE Secretary General Ján Kubiš. The Russian ambassador in Chişinău criticized the fact that Russia was not invited to attend. Ilham Aliyev, the president of Azerbaijan, said after the summit: “Our organization is emerging as a powerful force, participating in resolving problems in the Caspian–Black Sea region” while the president of Ukraine, Viktor Yushchenko, said that a new page had been written in the history of the organization. From 22 to 23 May 2006, Ukraine and Azerbaijan announced plans to further increase the GUAM member relations by renaming the organization GUAM Organization for Democracy and Economic Development and establishing its headquarters in the Ukrainian capital. The other members said this was a remarkable step and development. The summit participants were also expected to adopt GUAM by-laws, a declaration and a communiqué. On 30 May 2006 the Ukrainian Defense Ministry announced plans to establish GUAM peacekeeping forces. On 19 June 2007, presidents of Lithuania, Poland and Romania joined the leaders of GUAM member states at the GUAM summit in Baku, Azerbaijan. Also participating at the summit were the Vice-President of Bulgaria, the Vice-Speaker of the Estonian parliament, the Minister of Economy of Latvia, and the high-level representatives of the United States, Japan, OSCE, the Organization of the Black Sea Economic Cooperation (BSEC), UNESCO, and heads of diplomatic missions accredited in Azerbaijan. Ukrainian Foreign Minister Pavlo Klimkin said on December 5, 2014 that at a session in Basel, Switzerland, he proposed that participants speak English instead of Russian, which was the main language used in official gatherings in the Soviet Union. He said that the other representatives agreed. On 21 April 2005, the GUAM countries formed a common front on several issues in the CIS Foreign Ministers Council that was held at that time in Moscow. Ukraine, Georgia and Moldova lodged complaints against restriction imposed by Russia against some of their national products. At the same time, the four GUAM countries made a proposal to discuss the “frozen conflicts” of Transnistria, Abkhazia, South Ossetia (in which the separatist forces are Russian-supported) and Nagorno-Karabakh (sometimes these regions are referred to by the acronym TAKO ). Lastly the other three GUAM nations supported Ukraine’s proposal to condemn the Holodomor, the 1930s famine in Ukraine, as a genocide. Another of the issues associated with GUAM is competition between two proposed transportation corridors to better link Europe with Asia. Russia, Azerbaijan, and Iran have already been through rounds of negotiation on their plan, the North-South Transportation Corridor (INSTC); neighbouring countries (formerly, but no longer with the exception of Armenia) have expressed enthusiasm as well. This corridor would travel along the border between Russia and the Baltic states of the European Union, then continue south through Ukraine. ^ “Russian Deputy FM: “GUAM not anti-Russian group““. Today.az. 23 May 2006. Retrieved 18 April 2007. ^ Russia suspicious of GUAM motives. ETH. 2007-06-20. ^ “Axis of Evil Shaping Against Moscow”. Kommersant. 3 March 2005. Archived from the original on 20 May 2014. Retrieved 18 April 2007. ^ “Ex-Soviet GUAM Group Drops Russian, Switches To English”. Radio Free Europe/Radio Liberty. 5 December 2014. Retrieved 14 January 2015. ^ “Itar-Tass article”. Itar-Tass. Archived from the original on 30 September 2007. Retrieved 18 April 2007. ^ “GUAM Leaders Hail Chişinău Summit”. Civil Georgia. 22 April 2005. Retrieved 18 April 2007. ^ “Foreign Ministers of Georgia, Ukraine, Azerbaijan and Moldova Discussed the Upcoming Guam Summit”. InfoMarket. Moldova Azi. 19 May 2006. Retrieved 18 April 2007. ^ “Ukraine suggests setting up GUAM peacekeeping unit”. Today.az. 31 May 2006. Retrieved 18 April 2007. ^ “President of the Republic of Lithuania”. www.president.lt. Retrieved 7 April 2018. ^ “Embassy of Azerbaijan in the U.S.: Baku hosts GUAM Second Summit”. Archived from the original on 27 September 2007. Retrieved 24 August 2007. ^ “Ex-Soviet GUAM Switches To English”. RadioFreeEurope/RadioLiberty. Retrieved 7 April 2018. ^ “CIS Split at Ministerial Conference”. Eurasia Daily Monitor. 25 April 2006. Archived from the original on 17 April 2007. Retrieved 18 April 2007. “Official website”. GUAM Organization for Democracy and Economic Development. Archived from the original on 27 December 2008. Retrieved 18 April 2007. “Ukraine suggests setting up GUAM peacekeeping unit”. Today.az. 31 May 2006. Retrieved 18 April 2007. “Azerbaijan-GUAM”. Ministry of Foreign Affairs of Azerbaijan. Archived from the original on 16 April 2007. Retrieved 18 April 2007. “Ukrainian President Yushchenko: “GUAM will acquire the status of an international organization May 23““. Today.az. 18 May 2006. Retrieved 18 April 2007. “Ukraine says GUAM must focus on cooperation with EU, NATO”. Today.az. 23 May 2006. Retrieved 18 April 2007. “Official website”. INSTC (International North-South Transport Corridor). Retrieved 18 April 2007. “The GUUAM Group: History and Principles”. guuam.org. Archived from the original on 28 July 2007. Retrieved 12 June 2007. “Welcome to TRACECA”. 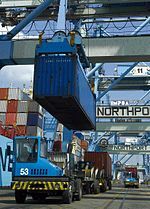 TRACECA (Transport Corridor Europe Caucasus Asia) IGC. Retrieved 12 June 2007. “GUAM Group”. Eurasian Home. Archived from the original on 1 September 2007. Retrieved 12 June 2007.